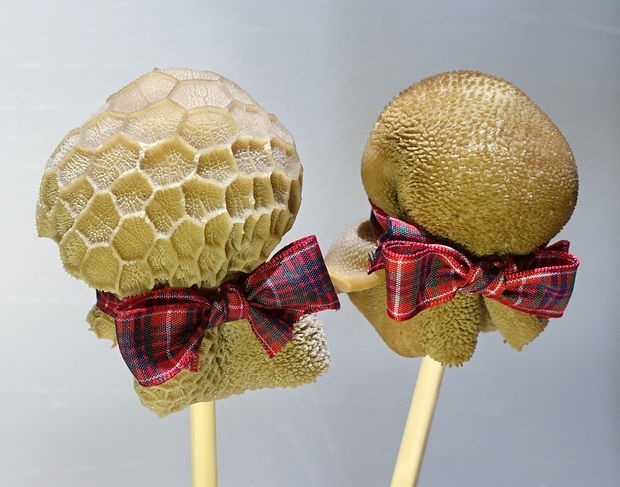 If the mere mention of the word “haggis,” grosses you out… stop reading now. If you’re intrigued by the appearance above, but you’re the type of person who eats hotdogs so long as no one mentions how they’re made… stop reading now. If your house is covered in cute lambs and Little Bo Peep décor… stop reading now. The whole 2 people that are left, check out these!! That’s the picture I wanted to put up top but knew that the one with a bite out of it might get some nasty comments. 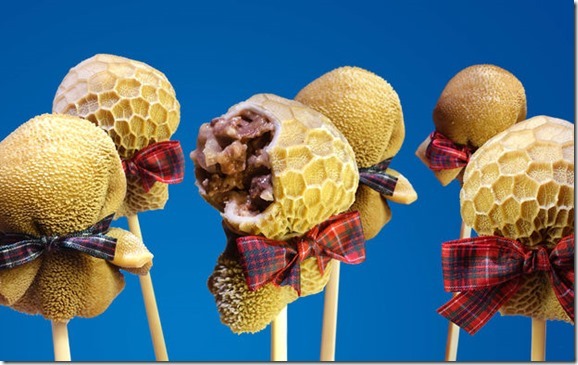 Those are seriously the cutest presentation one could ever find for stuffing sheep organs inside their own stomach lining. I had no idea that the texture of the stomach lining was so varied either… so the pops all look different! It’s probably a good thing I don’t come from a country where this is the norm… Or at least not one where it’s easy to find ingredients like this, huh? Also, don’t these look like mushrooms before they’re finished? 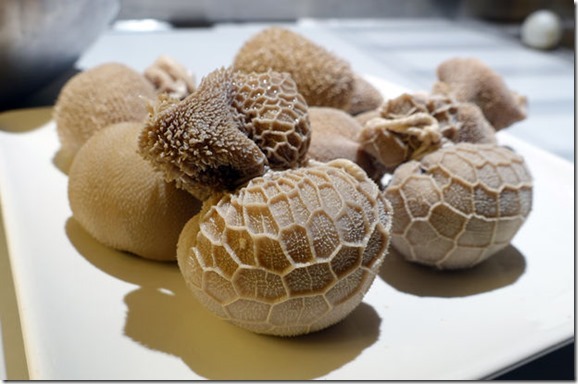 A really weird mushroom, of course, but mushroomy nonetheless! And now for the link and disclaimer to the full tutorial for how to make your own (I’m looking at you, Scots!). I would love to say that I spent hours and hours on some of these projects, but realistically, most of them were thrown together at the last minute. Or… even when I was pre-planning and knew I wanted to do something quirky, the end result was still only going to take a couple extra minutes to make. 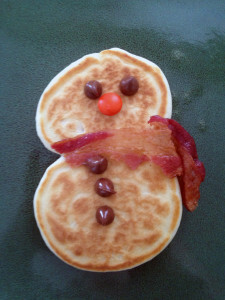 For example, the snowman pancake above…. Without the quirky factor, I would’ve still been making bacon and pancakes, so the amount of time it takes to make those remain the same regardless. The only real difference is that instead of making a single pancake in a pan or on a griddle, I put two small ones right next to each other (one slightly bigger than the other, of course). 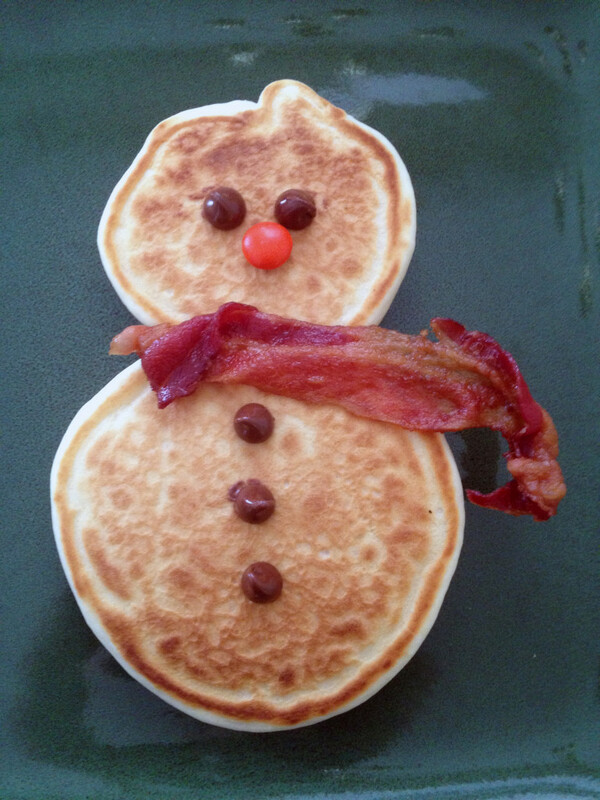 Instead of putting the bacon on the side of the plate, I laid it carefully on top to create a snowman scarf. And do you know how long it took me to dig out chocolate chips and M&M’s from the cabinet to create the eyes, noses, and buttons? Probably 30 seconds…maybe a full minute if the box where I keep all those goodies got pushed to the back and required I climb on a cabinet to reach them. Whoop-de-do. I made several different snowmen that day because there were multiple people needing fed, but even so, that means with an assembly-line production, I maybe added an extra five minutes to how long it took for breakfast. Nobody starved in that amount of time and my daily schedule wasn’t drastically thrown off that day. That amount of time was less than it takes to find the missing shoe for any given morning, so if it means spending those few minutes to make everyone giggle when they get their plates… I’m good with that. So there’s one that I had never considered being creative with. I love me some Totino’s pizza rolls….despite how horribly unhealthy they are. Or maybe it’s BECAUSE they are so unhealthy that I love them from time to time. I see them as a convenience food, though, that gets tossed in the oven (or even the microwave when I’m desperate…shh). I wouldn’t have considered turning them into something more fun, but she did! 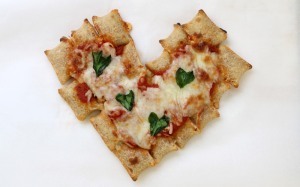 And it was as simple as tossing some pizza sauce, some cheese, and a few heart shaped spinach leaves a top a pile of pizza rolls arranged into a pointy heart. I would probably replace the green stuff with some carefully cut pepperonis instead. After all, if I’m going to indulge in cheap, unhealthy food, why spoil it with green stuff? My mother taught me better than that!